First Of Controversial Bird Flu Studies Is Published : Shots - Health News The paper describes experiments that suggest just a few genetic changes could potentially make a bird flu virus capable of becoming contagious in humans, and causing a dangerous pandemic. A fierce debate has raged over this study for months, because of fears that the work might provide a recipe for turning bird flu into a bioweapon. The paper describes experiments that suggest just a few genetic changes could potentially make a bird flu virus capable of becoming contagious in humans, and causing a dangerous pandemic. For months, a fierce debate has raged over this study and another one like it. The question was whether the full details should be kept secret, because of fears that the work might provide a recipe for turning bird flu into a bioweapon. But even though the details of this study are now available for all to see, and the other experiment will be published soon, that doesn't mean the controversy over lab-altered bird flu is over. And it doesn't mean that scientists, journal editors and government officials are prepared for the next furor like this one. The saga of this particular bird flu manuscript, which was published in Nature, began back in August of last year. That's when the paper was submitted to the journal by Yoshihiro Kawaoka, a researcher at the University of Wisconsin, Madison. Kawaoka has been trying to understand how flu viruses out in the wild might change and start spreading in people. Only about 600 people have gotten sick with the bird flu virus known as H5N1, and they weren't contagious — but more than half of them died. To see if this virus might be capable of becoming contagious in humans, Kawaoka's team put a key gene from H5N1 into a different flu virus and showed that just a few genetic changes could make this new hybrid virus contagious between ferrets — the lab stand-in for people. Initially, the scientific manuscript seemed like any other. "I wasn't aware of it at that point, because we get 10,000 papers every year," says Philip Campbell, Nature's editor-in-chief. He heard about the paper when his editors said it needed an outside review by security experts — to assess the risk that the information could be misused to make a bioweapon. And he soon learned that this paper had also come to the attention of the U.S. government, along with another bird flu study by the lab of Ron Fouchier, of Erasmus Medical Center in the Netherlands. Government officials consulted an advisory committee called the National Science Advisory Board for Biosecurity (NSABB), and it did something unprecedented for the life sciences. It recommended not publicly revealing the exact mutations that made the viruses transmissible. "For the first time, an organization with strong advisory influence ... was recommending that a paper not be published in full," says Campbell. The committee's recommendation, which was supported by the U.S. government, was the start of a huge fight in the scientific community as scientists publicly argued about whether the risks of full disclosure outweighed the potential benefits. Meanwhile, government officials tried, without success, to find some legal way of giving the full details only to scientists with a need to know, like vaccine researchers and public health workers who track flu viruses. Finally, at the end of March, the NSABB reconsidered the whole issue and reversed course, saying it would be OK to publish. That was a relief for Campbell. But he's not sure what lessons have been learned. "I don't think we're in a place where we know what to do the next time this happens," Campbell says. And some experts predict that there will be a next time. "There will be work — there has been work done already that we're just not aware of — which will raise all of these same questions and force us to make some very difficult decisions," says David Relman, a Stanford University microbiologist who serves on the NSABB. Relman agreed with publishing the Nature paper, but opposed publication of the one done in the Netherlands. It made a bird flu virus that was not only contagious in ferrets, but could also kill ferrets if the animals were directly given high doses into their respiratory tract. The Dutch government demanded that Fouchier apply for an export control permit — normally required for technology that could be used for weapons — in order to submit a revised version of his paper to the journal Science. He did so under protest, saying his work is basic science that's exempt from export control laws. The Dutch government granted a permit last week. "There are no further legal problems. Science has started the editing process," Fouchier told NPR via email. "I am not sure how long it will take. I am guessing a bit longer than usual, as we all want to be as thorough as possible on this one." But even though the debate over publication has reached its endpoint, this kind of flu research remains controversial because some say the risk of misuse or an accidental lab escape is not worth the benefits to public health. "Many of my colleagues feel that this sort of research is not going to lead to the next critical vaccine or therapeutic," says Ron Atlas, a biodefense expert at the University of Louisville. He personally wants to see this kind of flu research go forward. "I think that it's a stepwise progress towards where we need to be, and that the research is critical," says Atlas. 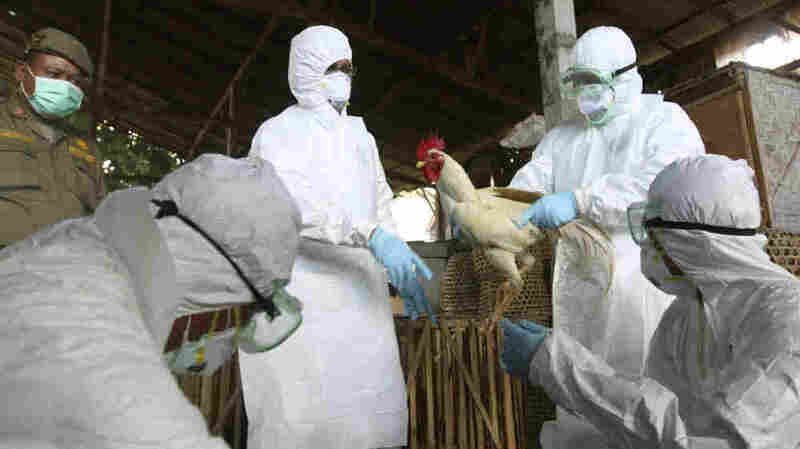 Work on transmissible bird flu viruses has been on hold since January, when scientists voluntarily stopped their experiments to allow time for a discussion of the risks, benefits and necessary safeguards. Reached by email, Kawaoka said "at present, there is no specific date set for lifting the moratorium." And Fouchier said, also via email, that the timing might depend in part on the implementation of a new policy that the U.S. government has just put in place for federally funded work, like these flu studies. The policy now requires a full risk assessment of proposed experiments with certain dangerous pathogens before any work is done, and officials must determine how to limit those risks. The government recently did a review of projects that are already under way. "And there were just literally a handful that made us say, 'We'd better take a closer look at that,' " says Anthony Fauci, director of the National Institute of Allergy and Infectious Diseases. "That doesn't mean they're not going to continue, it doesn't mean that they're not going to get published once the results are in, but it just calls for an extra look in accordance with the new policy." Only 10 studies were flagged as needing that extra look — and seven of those involved influenza. Kawaoka told NPR that he was not concerned that the new policy would have any effect on his future flu work or his ability to freely share his results. "Our research is critical for public health. Why would anyone want to negatively affect research important for public health? While the policy will need to be implemented appropriately, the aim is to ensure that research that could be directly misapplied is identified early in the process and decisions/changes made then," Kawaoka wrote in an email. "The policy statement acknowledges the value of research and says the impact on legitimate research should be minimized."